Stanley Martin Lieber (1922-2018) was born in Manhattan to Romanian-Jewish immigrants. He grew up in poverty, working all sorts of odd jobs from a young age, including delivering sandwiches and selling newspaper subscriptions. He dreamed of becoming the next great American novelist, and wrote obituaries in his spare time. Upon graduating from high school at 16, he got a job as an assistant at Timely Comics, a company started by his cousin’s husband, Martin Goodman. Lieber spent his time refilling inkwells, erasing pencil marks, and bringing lunches – for $8 a week. Eventually, he got a chance to write something of his own. 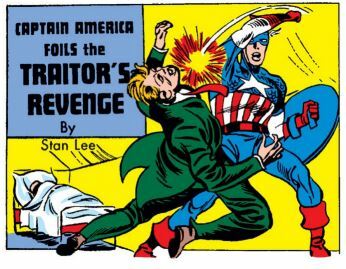 Joe Simon and Jack Kirby (also Jews) had recently come up with a new hit superhero – Captain America – and needed content. They gave the young man a shot, and he wrote his first story under the pseudonym “Stan Lee”. He would later explain that he did this because in those days comics were still unpopular and generally regarded as silly, and he was embarrassed to put his real name. His story was a success, turning Lee into a writer. When Kirby and Simon left Timely Comics over a dispute with Goodman, Lee was put as a temporary editor, despite being just 19 years old. As his stories continued to be hugely successful, Lee went from temporary editor to editor-in-chief, holding the position for over 30 years (except for a few years of service in World War II). Timely Comics would be renamed Marvel Comics, and Lee would co-create (mostly with Jack Kirby, who returned to the company) some of the most popular superheros of all time, including Spider-Man, Iron Man, and the Hulk; the X-Men, Fantastic Four, and the Avengers. Lee’s heroes and stories were unique in that they did not portray the typical, flawless protagonist. Instead, his characters were more complex, had everyday problems, and were sometimes just outright nerdy. The stories explored deeper, and at times darker, themes. These became wildly popular, opening up the comic book market to a much wider audience. Lee also pioneered a new approach of connecting comics writers with their fans to build a strong comic book community. Unlike others, he would credit writers and illustrators right at the front of the issue, and even name inkers and letterers that were typically omitted from mention. Lee was at the forefront of social change, writing about serious topics that were still taboo (like drug abuse), while introducing the first African superhero in comics in 1966 (Black Panther) and the first African-American superhero in 1969 (Falcon). Lee himself wrote countless stories, edited just about all the others, and also penned a monthly article, “Stan’s Soapbox”. In 1981, he moved to Los Angeles to take Marvel from print to television. He would serve as a producer on multiple TV and film adaptations of Marvel characters, most famously in the current Marvel Cinematic Universe – now the highest-grossing film franchise of all time. Lee was also a noted philanthropist and has done a great deal of charity work (especially through his Stan Lee Foundation). He was happily married for nearly seven decades. Lee struggled after his wife passed away last year, and a number of people sought to take advantage of him in his old age. Sadly, he passed away yesterday, at 95. 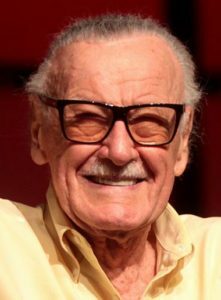 Disney CEO Bob Iger called him “a superhero in his own right,” and said: “The scale of his imagination was only exceeded by the size of his heart.” Click here to see a tribute to Stan Lee, featuring some of his best movie cameos. I used to be embarrassed because I was just a comic book writer while other people were building bridges or going on to medical careers. And then I began to realize: Entertainment is one of the most important things in people’s lives. Without it they might go off the deep end. I feel that if you’re able to entertain people, you’re doing a good thing. This entry was posted in Arts & Entertainment and tagged Avengers, Black Panther, Captain America, Comic Books, Disney Legend, Falcon, Fantastic Four, Iron Man, Marvel, Marvel Cinematic Universe, Romanian Jews, Spider-Man, Stan Lee, Timely Comics, Walk of Fame, X Men on November 13, 2018 by Jew of the Week.